← 5 Boro Bike Tour. Memorial Day on the Intrepid. I really, really, really wanted to see Top Gun on the flight deck of the Intrepid but seeing as how we were somewhere around 8,000th in a line that seemingly crossed the Hudson it just didn’t happen. 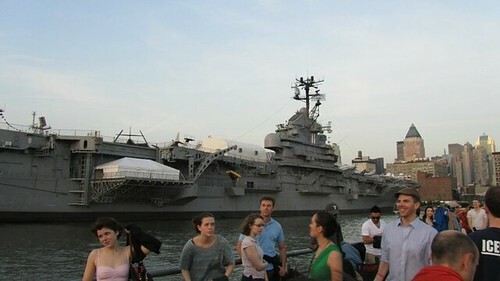 It was part of their Summer Movie Series & Fleet Week festivities. I now see we should have skipped the stop at Whole Foods for supplies and probably even should have camped in the line that morning. This is a reminder that there are 8 million people here at any given time add to that tourists and space gets limited real fast. Despite the outlook I stood in that line for about an hour anxiously anticipating that we would indeed get on the boat ship. People started eating their picnic fare while in line and just as we were still nowhere near the front of the line an Intrepid staffer came around to let us all know that they stopped taking passengers. Boo. It wasn’t meant to be. On Friday that is. If you look really closely to the far right near the tip of the ship you can see the people that are in the front of the line. The larger people in the foreground are actually in the part of the line that has doubled over on itself. Needless to say we didn't get on the ship that night. Next time we'll get there really early. On Monday – actual Memorial Day – we did get on the boat ship. Of course this time I really wanted to get on a different boat ship. See, the Intrepid is a museum, it’s here all year but the USS Iwo Jima was here just for Fleet Week. So Monday – despite being completely and utterly exhausted from a long weekend I made a game time decision that I really wanted to go to the piers. I thought I’d regret it if I didn’t and so off we went. Not exactly early in the morning but still we might have a chance. I hoped that the tourists would be traveling back home and I’d have it all to myself. (Let’s be clear, NYC tourists are like grey hairs or roaches – if one leaves, 3 take their place). Sure enough, the lines were ridiculous. 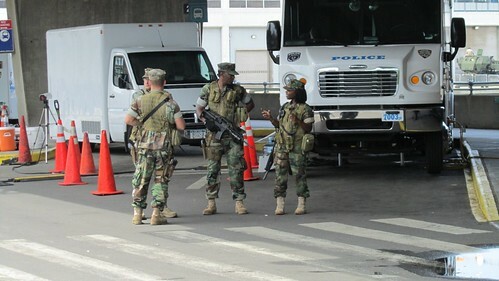 the men with rifles in combat looking gear informed us that the line was approximately 4 hours long. Cooler heads prevailed (Paul) and after some reluctance (me) we stood in the line for the Intrepid rather than calling the whole day a wash. It looked long but it wasn’t really (maybe 35 minutes?). Security was embarrassingly lax to say the least. I mean they had lots of people there and I expected a real search but to be honest we got frisked with more enthusiasm at the Mets game the day before. Granted they did have airport style machines we had to walk through I felt like it was lacking. I will say however, that when a man and his 5 or 6 year old tried to cut in line near the front the staff was all over him, they radioed for security! Whatever, the Intrepid was kind of amazing and huge. I am sure the few areas they let guests explore are only a fraction of the whole. I’d like to really check out the whole thing. (you can bet that Fleet Week is already on my calendar for next year) We got in just in time for the Search and Rescue demonstration which was sadly, a let down. YES, it was cool but it would have been cooler if the current hadn’t blown the dummy about a football field away from where it started. The soldier on the Intrepid that was narrating the event at one point could be heard saying “I can’t even see what’s happening!” – it’s a good thing my camera has like 14x zoom. On the whole it was fun but hot. After that we decided to start on the flight deck and work our way down. 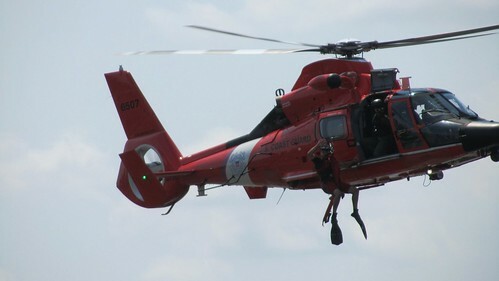 after the "rescue" the helicopter circled back toward us for a victory lap. There were some loud grumblings in the audience hoping for a do-over within our line of sight. I was most interested in the size of the planes up there. Well that and how many fit on the one ship. I think I counted about 12 maybe more. This was a time I wished my father was with me, he would have been blown away. He loves this kind of stuff – history. He was not a war hero nor did he ever serve but he has a good respect for the foundations that we build our lives on. When I moved to New York I sent him an 8 disc PBS DVD set chronicling the history of New York and so we had some good conversational topics for a while. On the Intrepid I bought him a dvd about its history. He’d love to come and see all this amazing-ness that is New York himself but unfortunately due to illness that just isn’t in the cards now. I think about that a lot when I’m out here exploring. Or when Paul tries to drag me out to the far reaches of nowhere on a goose chase – I should do this because my dad can’t. More on that later maybe for now more Intrepid. 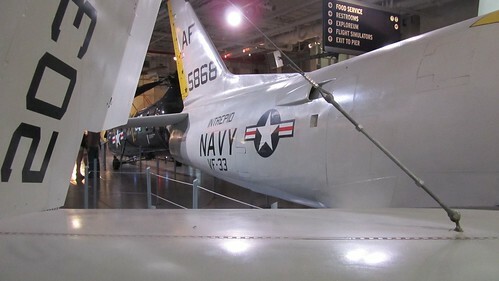 these planes were actually inside the Intrepid along with several more of their closest friends. Below deck (that’s ship talk for downstairs), we found some pretty awesome displays and activities. I had no idea that the Intrepid was so kid friendly. There were a few cockpits you could get into, some hand cranks that turned things on, a really awesome 3G simulator and so much more. On Memorial Day though there were so many people there that I wasn’t able to be a kid but then again I’m not. There was a ridiculously giant propeller that I tried to grab a snapshot of but I just couldn’t get the whole thing in the shot without someone getting in front of me. For all its history and glory the Intrepid offered its guests a chance to eat in the “mess hall” where an Au Bon Pain had set up shop as a permanent restaurant on the ship selling salads, sandwiches and other healthy snacks. A soldier and his young daughters at near us. There were some other displays on the same level as the mess hall which showed examples of some sleeping quarters where 30 beds were shoved together and where high ranking officials only had to share with one other and they even got their own tiny sink and desk. Passing the glass enclosed kitchen you got the feel for the machine-like precision it must take to keep so many men fed each day. 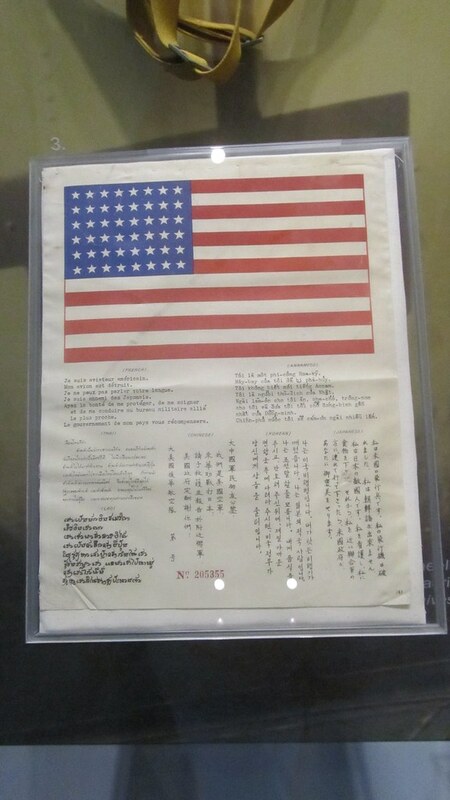 One thing that really intrigued me and I’m sorry my photo of it is so awful, was a letter that soldiers carried with them with writing in several different languages all explaining that they were an American soldier fighting against the Nazis and they don’t speak the native language but need help. This is the kind of thing that really hits home. 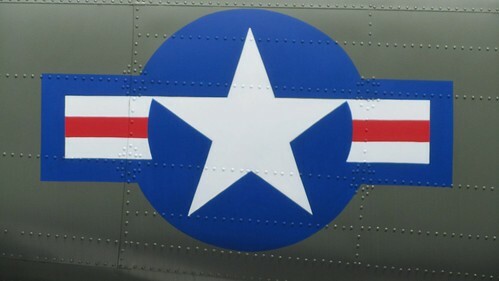 Paul’s Dad was a real live WWII veteran. Being on that ship I couldn’t even begin to imagine the real conditions and struggles those men endured to fight for the greater good. He made it home and had a very long and full life, not everyone does. This entry was posted in events, everything i've blogged, locations and tagged Firsts, Holidays, museum, walking, weekend adventure. Bookmark the permalink.